(L-R) Rod Riley (Word Entertainment President & CEO), Kurt Kaiser (Word’s first A&R director and artist), Oscar Reese (One of the first Word employees), John Esposito (Warner Music Nashville President & CEO), Judith McCracken (wife of Word founder, Jarrell McCracken), Mike Curb (Chairman of Word Entertainment) and Lisa McCracken Lacy (daughter of Word founder, Jarrell McCracken). The Christian music division of Warner Music Group recently celebrated its 60th anniversary with a special celebration in Waco, Texas, where the label was founded by Baylor University graduate, Jarrell McCraken, in 1951. In honor of the label’s anniversary, Word Entertainment recently released a 3-CD compilation featuring a 51-song collection with a bonus excerpt from the company’s original recording, entitled, Word: Six Decades Of Hits. The anthology spans 60 years of music featuring artists such as Amy Grant, Sandi Patty, Point of Grace, Jaci Velasquez, Francesca Battistelli, Chris August and Sidewalk Prophets. On hand for the celebration were members of the McCracken family as well as Waco Mayor, Jim Bush; Chairman of Word Entertainment, Mike Curb; Warner Music Nashville’s President & CEO, John Esposito; Word’s first A&R Director and artist, Kurt Kaiser; Word Entertainment’s President & CEO, Rod Riley; and Baylor University President, Ken Starr. 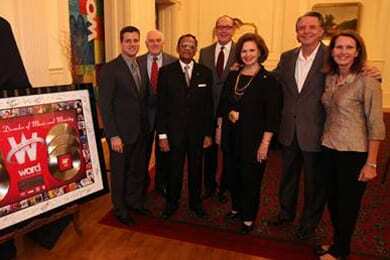 A commemorative plaque was presented to the McCracken Family and Baylor University on behalf of Word Entertainment. Waco Mayor Jim Bush proclaimed, November 2 as “Word Day” in Waco, Texas.